Credit card debt rose to a record $1.04 trillion in June, a sign of heightened consumer spending confidence. The Federal Reserve said outstanding credit card debt rose at an annual rate of 1.5% in July after declining 1.4% in June. Non-revolving debt, which includes student loans and automotive financing, rose 6.4% to $2.88 trillion. Demand for workers also rose to a record in July with 6.9 million job openings posted by employers. 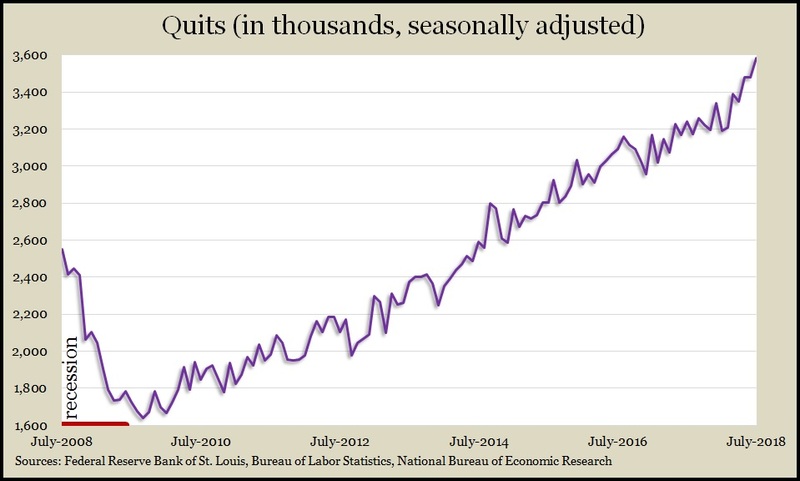 The gap between openings and hires grew, according to the Bureau of Labor Statistics. The number of hires has fallen short of openings each month since the beginning of 2016, a sign of a mismatch between employer requirements and worker experience. Another indicator of the tight labor market is a record number of workers quitting their jobs, presumably confident of better opportunities. The Bureau of Labor Statistics said wholesale inflation declined 0.1% in August, continuing a deceleration that began in May. The setback was led by declines in prices for trade services, transportation and warehousing, and food. The core Producer Price Index, excluding costs of food, energy and trade services, rose 0.1% from July and 2.9% from August 2017, which marked a third consecutive rise. The four-week moving average for initial unemployment claims declined for the ninth time in 10 weeks, reaching its lowest point since late 1969. Labor Department data show the average level of jobless applications 41% below the 51-year average, which it has been under for more than five and a half years. The indicator is a persistent sign that employers have been reluctant to let go of workers in a strong hiring market. The broadest measure of inflation rose 0.2% in August, led by higher prices for gas and shelter. According to the Bureau of Labor Statistics, the core Consumer Price Index, which excludes volatile food and energy prices, rose 2.2% from the year before. It was the first time since November that the year-to-year rate was lower than the month before. The Federal Reserve reported that industrial production rose 0.4% in August, matching its gain in July and marking its third consecutive increase. Manufacturing output also rose for the third month in a row, led by the automotive industry. Capacity utilization increased to 78.1%, its highest level since April. Utilization, which tends to rise in advance of inflation, still was below the 45-year average of 79.8%, which was last reached in April 2008. August retail sales rose for the seventh month in a row. According to a Commerce Department report, 10 of 13 categories increased sales from July, led by gas stations, where higher prices sent receipts 20.3% higher. Year-to-year, overall sales rose 6.6%, beating the long-term average of 4.3%. Twelve-month movements ranged from a 20.9% increase in gas sales to a 4% decline at sporting goods and hobby stores. The University of Michigan said its preliminary consumer sentiment index for September reached the second-highest point in 14 years. Optimism was widespread across demographic measures, with expectations at their highest level since July 2004. Concerns about trade tariffs continued to weigh on the outlooks for many consumers. Nearly equal numbers anticipate uninterrupted economic growth and a downturn in the next five years. In a sign that companies are trying boost supplies to keep up with demand, business inventories rose 0.6% in July while sales gained 0.2%. As a result, the ratio between inventories and sales increased slightly after a long trend of declines since early 2016. Rising inventories help elevate gross domestic product, but if they are out of balance with sales, they can cause bumpy movements in production and employment. Commerce Department data showed year-to-year growth of 4.3% for inventories and 8.1% for sales.